A growing number of city slickers are foraging for fruit growing in a neighbor's backyard, for mushrooms in the local park or for weeds by the roadside that might make a nice salad. We talk to local foragers about how to hunt down and prepare dandelions, berries, snails, frogs and other delights. Nettle is great. It's all around, good for you, plus there's the element of danger when you're harvesting. It's like collecting sea urchins. Will it get you? Are those gloves really thick enough to ward off those spiny stems? A question I've been forced to answer in the negative far too many times. For those of you that like a bit of danger with your foraging, but aren't quite up for wild mushroom collecting or boar hunting, nettle is a good bet. There are two kinds of nettle that grow in our area (that area being Northern CA). Urtica diocea, which is also known as river nettle, and Urtica urens, which I call farm nettle, it's more often cultivated, and much less intense cousin. River nettle is what grows most often in the wild, so that's what I end up using most of the time. You'll find it often growing in stream beds and in other moist nutrient rich environments. "Farm Nettle" can also be found wild, although much less often, in what are referred to as "disturbed places." Areas where the earth has just been upset for some reason. River nettle (diocea) is much more intense in both sting and flavor. Whereas farm (urens) will give you a bit of a prick, river nettle will bite you, a searing pain that, instead of going away after several hours of throbbing, actually seems to turn into a general numbness/tingle for as much as 48 hours (hint: use vinegar to get rid of the sting). If you're using it in soup, river nettles are really the best. The intensity comes through in the soup in all the best ways. Hank Shaw, author of "Hunt, Gather, Cook: Finding the Forgotten Feast"
With that said, lets get on with it. Go collect some! I won't tell you my spots, but I will tell you that they like to grow in moist, nutrient rich soils. Try to harvest them before the plant has gone to seed. As in all plants, you want to collect them when they're putting the most amount of energy into the part you want to eat... perhaps confusing, but a good principle. When plants are flowering, eat the flower, when they're shooting up out of the ground in spring, eat the shoot, when they've gone to seed, eat the seed. Enough talk, on to the recipe. 1.First, you've got to deal with the nettle. Put a pot of salted water on to boil. With your gloves on, use scissors to cut the leaves from the woody stem, discarding any brown leaves. Wash under cold water. Get a mixing bowl, and fill it with iced and salted water. Throw nettle into boiling water for 5 minutes, drain, then immediately place in ice water. This is called blanching and shocking. The boil gets rid of the nettle sting, and the ice water helps it retain its vibrant green color. Once they're cold, squeeze water out of nettles, and reserve. 2. Cut off the white section of the leeks, slice them lengthwise, and wash very well. Tons of dirt likes to get stuck in leeks, and it's the last thing you want in your soup. After they're clean, chop them and reserve. 6. Allow to simmer 20-30 minutes, until potatoes are tender. Turn off heat and either blend with you immersion blender, or if using a stand-up, blend in batches with a ventilated blender (take that little plastic thing out of the middle of the lid), and a towel on top. With the danger sounding too much like you dad, BE CAREFUL! Hot soup on the face is not fun. 7. When its blended, add two spoonsfulls of crème fraiche, mix. Serve hot with a drizzle of crème fraiche on top. This soup will taste quite ?green?. Crème fraiche will balance it to your liking. 8. Enjoy! And regal your friends with your daring tales of nettle foraging, they'll be impressed. For a mushroom lover, the cornerstone of all recipes is a luscious mushroom soup. We regard this combo as the ultimate soup and sandwich for all the seasons of the year. Just change the type of mushroom used with the season. A bowl of this soup with a mushroom-laden tartine tucked alongside is a meal to cure all that's amiss. Our recipe has double layers of mushroom flavor, its foundation is a rich mushroom stock. Yes, it's easier to use chicken stock and yes, the soup will be mighty tasty. It just won't be the ultimate, rich mushroom soup if you don't make the mushroom stock. The second tier of the flavor comes from the mushrooms themselves, whether they be wild meadow mushrooms, their cultivated cousins ? cremini, portabellos, button mushrooms ? or other wild fungi. After a jackpot of a hunt in any season, this recipe can become luxurious chanterelle soup, porcini soup, or even the wildly extravagant morel soup. Though not intentionally so, this recipe is vegetarian and can be vegan if you omit the touch of cream and butter. Place the porcini mushrooms in a medium saucepan with 2 cups mushroom stock. Bring to a boil, turn off the heat and let sit for 30 minutes. In a large stockpot over medium heat add 6 tablespoons butter. When the butter is melted and bubbling, add the onion, garlic, ½ teaspoon of the salt, and the pepper, stirring to coat evenly with the butter. Cook until softened. Stir in the Mediera. Cook for 3 more minutes, then stir in the porcini mushrooms and their soaking liquid. Add the remaining 2 cups mushroom stock and the thyme. Bring to a boil, then turn down the heat and simmer for 30 minutes. Turn off the heat. Add the remaining ½ teaspoons salt and let sit for 5 to 10 minutes. Carefully transfer the soup to a blender and, starting on a low speed and increasing in increments, puree until very smooth. Place the soup in a saucepan and return to the stove over medium heat. Add the cream. Whisk in the remaining 2 tablespoons butter and the lemon juice. Taste for seasoning and adjust with salt and pepper as needed. Stir in additional stock if the soup needs thinning. Divide the soup amongst 6 bowls and serve with the tartines. Place the ricotta in a small bowl. Add 1 tablespoon of the garlic, thyme, chives, 2 teaspoons of the parsley, tarragon, lemon zest, ½ teaspoon salt, 1/8 teaspoon of the pepper, and lemon juice. Mix well. Set aside. Heat the butter in a large sauté pan over medium-high heat. When the butter is melted and bubbling, add the mushrooms, tossing to coat evenly with the butter. Add the remaining ¼ teaspoon salt and the pinch of pepper. Cook until the mushrooms have released their liquid. Continue cooking until the liquid has evaporated and the mushrooms are starting to caramelize. Add the remaining 1 tablespoon garlic during the last few minutes of cooking. Remove from the heat and hold in a warm place. Toast the bread under a broiler or in a toaster. While the slices are still warm, rub the toasted surface with the whole garlic clove. Spread the toasts with about 2 tablespoonfuls of the ricotta mixture. Divide the warm mushrooms amongst the toasts. Drizzle with the oil, then finish with a sprinkling of fleur de sell and the remaining 2 tablespoons of parsley. The ricotta mixture can be made up to a day ahead and refrigerated. Remove from the refrigerator 1 hour before serving. Have the soup warm and the ricotta mixture ready before toasting the bread slices. They are best just out of the oven or toaster. 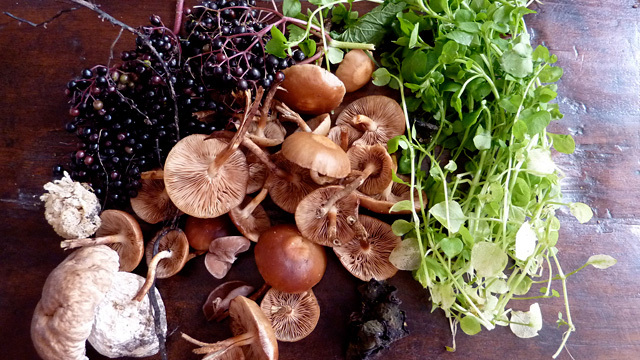 For the soup, you can substitute the "tamed" button, cremini, or portobello mushrooms for the wild meadow mushrooms. Almost any wild mushroom can be substituted in the is recipe. Use all of one kind, or mix them half wild and half cultivated. You can use chicken broth, beef broth, or canned mushroom broth for the homemade broth in the recipe. For the tartines, any wild mushroom will work beautifully. Wipe the edge of a martini glass with lemon juice and dip the glass edge in the candy cap sugar. In cocktail shaker put brandy, orange liquour and lemon juice. Shake with vigor again then strain into martini glass. To make a pudding with Turkish washcloth you simmer the seaweed in milk, after the seaweed disintegrates, gently strain it out, and stir chocolate chips and raspberries into the milk. After refrigerating, the pudding thickens to a consistency reminiscent of the chewiness of a pudding pop. The gelato recipe makes about 5 sandwiches- The cookies will yield about 24 cookies, but why make less cookies than that? - Bake 350F in conventional oven for 7 minutes then rotate pan and bake 3-4 minutes until golden. Note: If freezing the pre-scooped dough temper dough for 5-7 min before flattening and baking. Cookies should be flat. - Scald milk, sugar, and mushrooms. Let sit 1 hour. - Pour into cream. Cool and refrigerate overnight. - Strain out mushrooms before spinning into lined ½ Sheet pans. To assemble sandwiches have baked cookies ready and find a cutter that best match the size. Use that cutter to cut out the ice cream, sandwich together and freeze one hour before serving.